Remember what it was like to have ambition and belief that you could achieve what you set your mind to? Today I came across two items that make we want to rekindle that spirit and find a moment to feel the rush of hope that it's all possible. First there was an article on MSN.com on the women's page about making time for yourself (article). This article is more assertive in terms that you should be able to take back your time and set your mind to achieving your goals whether it's to write a book, run a marathon, or start a business - go for it, try it. I am a person who will try and act on my gut desires but there are many days and things I want were the goals aren't particularly hight and even then I'm simply not going to achieve them. 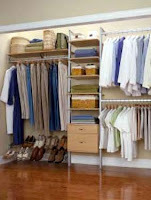 Like I don't even strive to have my closets at home look like a California Closet, in fact I once flipped through the ad catalog and thought if I only could make my closet look that good I'd be happy - it wasn't until spending a moment or two longer I realized that I was looking at their 'before' closet. Is my closet the only one that looks ten times worse than the before picture? The next quick moment of reflective dreaming came when I came across a young singer who has be named as an up and coming star in the UK, on BBC - Adele. She's 19. She doesn't come from any special family background, but she was focused and set up a MySpace site a couple of years ago, which was spotted and she's now bringing out her first album this month. I love hearing of people taking flight and here is a young woman who has managed to use social computing to create her opportunity. I wanted to hightlight Adele not because I have aspirations of being a singer (that would be scary!) but it makes me remember aspiration. We need to figure out a way to exercise our aspiration muscles so it can lead us to getting our minds hopeful of change, and then may be we can achieve the goals that MSN article identifies, or at least getting our closets to the 'before' pictures. ... Now as I've casually mentioned the California Closet company I went in search of the before picture to post from their website, but what did I find, not just a website that allows me to order shelves but a philosphy about as complex as taking up Buddism (or should that be as simple as?). There are tabs on rooms, okay that makes sense, but then there are inspiration areas where it's all about life which a woman walking in the shallow ocean with her skirt hitched up looking at pebbles. There are articles about swimming in cold lakes. I'm not quite making the connection between my closet and a cold lake but may be I will after reading some more articles on artisans. Okay I read some more on the site, still didn't make the connection with my closets. Maybe as this blog progresses we'll find out why I have a fear of the California Closet company - their intent seems genuine to consider your lifestyle with storage, and perhaps perfect storage would free me up to pursue other pleasures but not sure why that dream moment isn't coming to me. Wait a minute, I've just figured out my California Closet moment, it's when we're staying in a vacation rental property and I've taken just enough clothes for all family members for a 10 day trip, then I can hang matching clothes, shoes, jackets on minimal hangers without wrestling hangers into a closet where if things fall off their hangers they can stay floating off the ground for weeks before the pressure is such that they fall to the ground. (BTW those of you who know your closets will note the photo is not a Ca closet but some immitation, I mean, would Ca Closets allow that shirts on the pole? ).